Salted Butter - 4 Tbsp. 1) Preheat oven to 400 F. Place both sides of the baguette on a large baking sheet with the cut side up. 2) In a small bowl, combine butter and garlic and spread evenly on both bread halves. Place the mozzarella cheese slices on top of the bread, making sure the cheese covers the bread completely. Bake the bread for 12-15 minutes or until the cheese is melted. 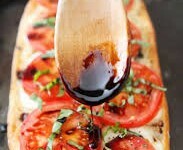 3) While the bread is in the oven, make the balsamic reduction. Place the balsamic vinegar in a small saucepan. Bring the vinegar to a boil, decrease the heat to low, and simmer, stirring occasionally, until the mixture is reduced by about half. This should only take about 5-7 minutes. Set aside. 4) Remove the bread from the oven. Top the bread with tomatoes slices. Season with salt and pepper, to taste. 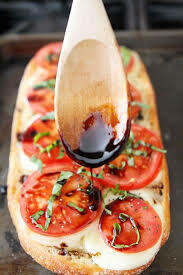 Add the fresh basil and drizzle with balsamic reduction. Cut into slices and serve.